“Spectacular red, yellow and green coloured flowers, shaped like cigars, opening at the tip of a wiry stem. Named after the daughter of a Californian stage coach-driver and pollinated in the wild by humming-birds”. Then there is Polygonatum Betberg. The black Solomen’s Seal. From the Black Forest near Laufen with stems and leaves of chocolate brown. These lovelies and the words above were in the Avon Bulb catalogue and are now on the potting shed shelf, poised for planting this weekend. September, October and November are far and away the busiest time of the year with planting plans and customers gardens. More and more cardboard boxes and sacks arrived with a fleet of delivery men. 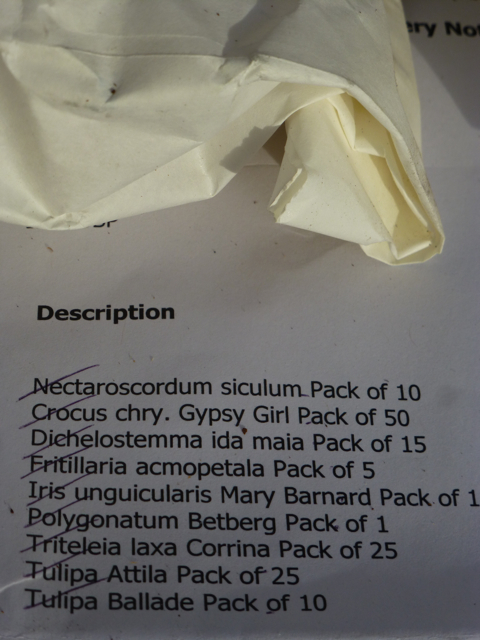 At the back end of ordering plants in such quantities, I felt like my son’s friend who pressed the wrong buttons on the Tesco click and order and ended up with 20 kilos of courgettes. 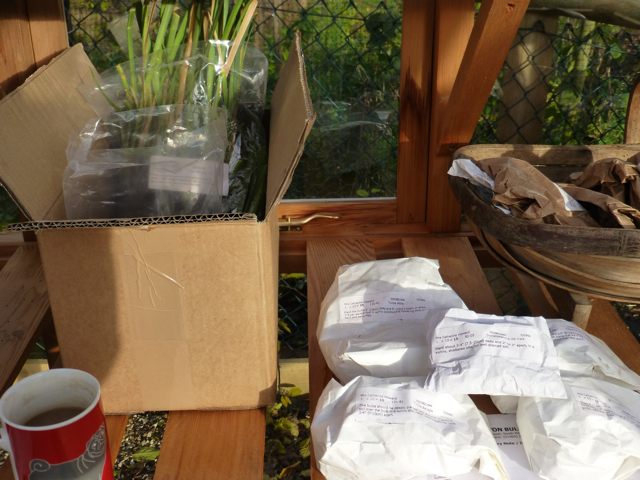 Anyway, the last customer tulips and roses went in this week and now, at last to my own plot. The real advantage of a small garden is that you can experiment with the weird and wonderful. I am always looking out to trial new plants and here the garden is a bit like a glass cabinet – in that I can keep a keen eye out on progress. Bulbs from Avon Bulbs and perennials from Knoll Gardens. Roll on weekend.